It looks like a big batch of sugar-laden brownies, doesn’t it? These aren’t brownies…these are Jamie Eason’s Chocolate Protein Bars! Try them, they are delicious! Many store-bought protein bars are loaded with sugar and other artificial ingredients. Try making your own so that you have something clean to grab when you are running short on time! You can read more about when we eat these protein bars in the post about our daily food. Looking for even more chocolate?! 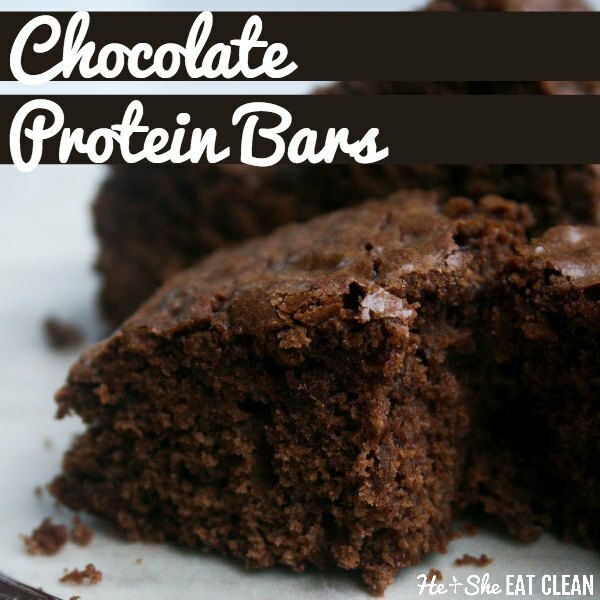 Try our Chocolate Chunk Protein Bars – DELICIOUS! 4. Combine the ingredients from the small bowl into the large bowl and mix together. 5. Spray 8X8 dish (I use Pyrex) with non-stick spray & add batter to the dish. 6. Bake for 20-30 minutes in the oven. We bake ours for 23 minutes so they are “gooey” like brownies. Once the protein bars have cooled, separate them into Ziploc bags or Saran Wrap so you can grab-and-go. You MUST store these in the refrigerator or freezer as they will spoil because they have no preservatives!